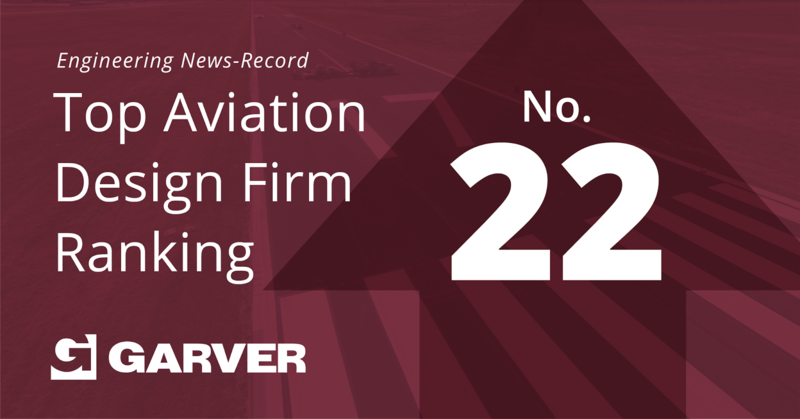 Garver continues to improve its standing among the country's largest aviation design firms, ranking 22nd in Engineering News-Record's annual list that counts revenue generated from airport projects in 2016. Garver’s revenues from aviation projects exceeded $20 million for the first time in 2016. It ranked 25th in last year’s ranking. Successful airport projects in 2016 include design services for a $35 million MRO hangar at the Nashville International Airport, taxiway rehabilitations at Dallas Love Field and Bill and Hillary Clinton National Airport in Little Rock, Arkansas, major pavement expansion at Huntsville (Alabama) International Airport, and construction oversight on projects at San Francisco International Airport and John F. Kennedy International Airport in New York. Garver also ranks 166th in ENR’s list of top design firms and 27th in ENR’s Texas & Louisiana Region that includes work in Arkansas, Louisiana, Mississippi, Oklahoma, and Texas. To learn more about what Garver’s Aviation Team can do for you, visit GarverUSA.com.